Michelle Kempton is the race director for Nova Scotia's destination race called Maritime Race Weekend. Michelle Kempton has inspired people across Canada by honestly documenting her journey of losing 120lbs, becoming a runner, admitting the challenges, discussing the obstacles and celebrating each victory. After an achilles injury and ankle fracture stopped her from running for 1.5 years, Michelle has shown true resilience starting over. Michelle has a story people want to hear and can relate to, her transformation encourages and inspires people from all walks of life to become active. 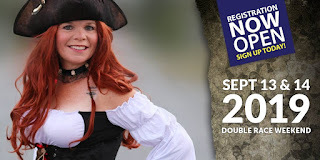 RACE DIRECTOR & EVENT PROMOTER: she created unique races on the East Coast and has generated energy and excitement within the running community. The race director for Maritime Race Weekend, a destination race and 2nd largest marathon event for Nova Scotia. She has also worked with the RCMP and Municipal Police to organize: Police Chase. RUNNING INSTRUCTOR: Michelle has taught hundreds of people how to run. Regardless of weight or age, she motivates them, is positive and encourages them that they can do it. She not only trains people to become active, but helps them to think positively about themselves and understand how strong they are both physically and mentally. FREELANCE WRITER: published in Canadian Running Magazine, Running Room Magazine, various blogs and newspapers, Michelle’s gift of communication has inspired people across the country. She successfully utilizes social media to spread a positive message to a broad audience. PUBLIC SPEAKER: Michelle is a sought after speaker by both runners and business professionals. Her humorous, down to earth and energetic presentation style keeps everyone engaged and she is considered both inspiring and motivational. RUN CLUB ORGANIZER: Heart & Sole Running Club became an overnight success. 2 years ago, Michelle and 5 friends created a free not-for-profit running club. The club quickly became the largest running club on the East Coast with over 700 members (and growing). She has been pivotal in creating a social network among runners. WOMEN OF EXCELLENCE: a panel of professionals reviewed accomplishments of business women and chose to honor Michelle as a leader, recognizing her important role and positive impact on the Health & Wellness industry. GOLDEN SHOE: nationally recognized Michelle as a leader in the running community by Canadian Running Magazine for making a huge difference in the running community. BEST BUSINESS START-UP: national iRun Magazine recognized Michelle as an innovative business woman for creating a unique race series that initiated a race revolution on the East Coast of Canada. COURAGE TO GIVE BACK: recognized Michelle as an extraordinary individual, who has shown great courage in surmounting personal hardships and has gone on to give back to her community. WOMAN OF SPIRIT: was presented to Michelle, she was recognized for being an ordinary woman who does extraordinary things. She was honoured for her outstanding spirit and contributions to her community and inspiring women. MOST INSPIRATIONAL: judges from national iRun Magazine declared Michelle a winner for not only improving her own life through running but for inspiring, motivating and empowering people across Canada about the benefits of running. • Michelle is the President of the Heart & Sole Running Club. A volunteer based, non-profit running club that welcomes everyone. The inclusive running group encourages runners of all ages to live a healthy lifestyle. • She organizes a free, non-competitive not-for-profit fun-run for children (ages 3-12) each summer in her community called the Dolphin Dash. • Volunteers at a local school, to encourage and coach elementary students in their school run club. • Helped start a free not-for-profit all-girls running club, which helps females (ages 5-12) participate in a learn-to-run program and hopefully gain confidence, become active and reduce the likelihood of obesity in their teen years. • Utilized her event management skills to assist the RCMP and local police to organize a fundraising event for the Special Olympics. • Has volunteered at most local road races. She’s always eager to offer assistance, regardless of the job: race-kit pick-up, water stops, finish-line medals, marshaling or clean-up crew. • Proud to be an ambassador for Moving Comfort and Brooks. • She also was selected to be the on the iRun Test Gear Team. Michelle made life changes and went on to become a mentor to many women. Michelle’s strongest asset is the knowledge and empathy she demonstrates to others about being large. She understands what it is like to be overweight and how differently you are treated. She encourages people to get active through walking or running. Michelle has inspired people in every age group to start moving and take ownership of their own happiness and health. She emphasizes it’s not how fast you move but that you are moving – she believes and tells others “no matter how slow you go, you are still lapping everybody on the couch”.